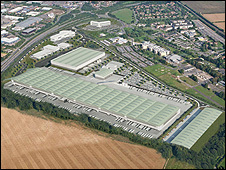 Controversial plans to build a "megashed" distribution centre in Hampshire have been approved. On Monday evening, Test Valley Council approved the plans for a 20-acre unit (80,174 sq m) at the former Andover Airfield. Developer Goodman said it would create hundreds of jobs and bring millions of pounds to the local economy. But opponents said local roads would be clogged up and they have vowed to seek a judicial review of the decision. Test Valley Borough Council's Northern Planning Committee had rejected the scheme at a meeting in September. But that decision was reversed by 13 votes to four at Monday's planning control committee meeting. Last month, Goodman terminated its contract with Tesco, which it had hoped would occupy the development, after it failed to reach an agreement over stringent environmental controls. The business park development also includes a hotel, offices and warehousing.